Google is the best source to get organic visitors to your blog for free, but for getting ton of organic visitors you have to write ton of blog posts with maintaining quality, right! Here in this blog posts I am going to share with you, how Google will index your blog posts on Google search engine quickly, every blogger wants that their blog posts will get index on search engines like Google, Yahoo, Bing or may be Ask. But here I am going to tell you about only Google, rest search engines probably will index your blog posts after sometimes, okay! Now directly come to the point, how it would be possible that Google will index your blog posts within a minute of publishing. but it takes time, one day it will start happening probably after 15 to 20 days after maintaining few things on your blog. So, here are those things you need to maintain for your blog and see the magic will happen for your blog. This really matter in blogging! If you wanna really succeed in blogging then be consistent in blogging, write at least 2 to 3 articles each and every week. 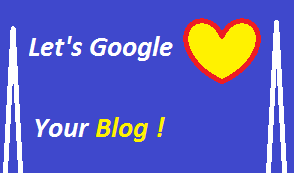 If you want that Google will love your blog then you have to write articles often otherwise, it would be difficult that Google will love your blog. Here is another unique thing for you, after publishing blog posts don't be too much happy now it's time to promote your blog posts, actually there are many ways to promote your blog posts, but I will suggest you one big source to promote your blog posts that is Google Plus don't ever forget to promote your blog posts on Google Plus, it will help you to get good rank on search engine Google as well as you will get direct traffic to your blog through Google Plus. Blog post length is awesome to get your blog posts on the top of the search engine for forever, probably you have seen your blog posts today on the top of the Google search results but after few days goes on down and down and may be never come back on the top that's only because of short article, see I don't know about you and not even about your blog but I do know one thing you can become one of the best blogger on your own niche in the world, only if you want to then only! See do one thing, that is HARD WORK! Where you need to do hard work to achieve any particular thing, I think value of that particular thing is more, than any thing need little work to achieve. So, straight come to the point, write article at least have 600 words but remember one thing whenever you are writing a pillar article then do write an article of at least have 2500 words, pillar article means those articles usually search people on the search engines, like for my blog SEO Tips, Blogging Tips etc. May be you are thinking, why? I am saying to write pillar articles of having at least 2500 words, because if an article is looking for world of people then it is sure many bloggers will definitely write an article on the similar topic, so take your blog posts on above the competitions write a blog post lengthy but remember one more thing, give value in the article that's why whenever any visitor will read the article they will be great for reading the article(In single word, I have to say complete key to lot of information and finally satisfaction for your readers). I think SEO is the best way to reach your audience and finally promotion of your blog, see if your blog is not helping search engine crawlers to read your blog post then how could be possible search engine crawlers will index your blog page quickly? First do basics SEO of your blog then go for advanced, but I think, if you will do basics SEO for your blog then I know you will get too much help for your blog to drive more traffic to your blog! One more way I found to get your blog post index more quickly, i.e. if you are writing a blog post on trending topic then probably no one can stop to get index your blog posts on the search engines even you will get ton of traffic for that particular blog posts. Probably you want to know, how did I get the concept, probably you have remembered every one wanted to get Google authorship for getting good rank on Google. Immediately, I have written an article, "How to Get Google Approved Authorship", then in a single day I have received about 150 unique visitors to my blog for a single posts and 10 comments too! I think this is good for any developing blog! What do you think let me know? I know every one want to become a professional blogger, but every one is not working hard to become a professional blogger, if you want to succeed in blogging then take it seriously stop copy paste from other blogs, just write an article a day, if possible with maintaining quality. This is enough to become a money making blogger, ultimately professional blogger! I am very thankful to you that you have really helped me in creating the website on which i am working but still am i beginner and throughout the cycle i will be requiring your help. Please tell me how to bring the subscription page when one opens the website page. Please guide me i will be very thankful to you.